ANOTHER blockbuster weekend of NAB League footy saw the best of the best stake their claims as the next big things, with one particular game showcasing some enormous talent to come. With scouts eyeing all nine games across the round, these are our individual, opinion-based thoughts on the players identified as standouts by respective talent managers. In his first game back, Potter showed good run and dash. He took several kick ins and played on for about four of them, often taking on the man on the mark and showing a bit of flair. He showed a great passage in the second half where he broke away inside the defensive 50, and ran 30 metres before delivering the ball long inside 50 in an attacking 80-metre plus play. Potter also tackled well throughout the day laying lots of hard tackles showing his competitiveness. Ended the day with 15 disposals and five tackles. ‘JD’ started forward and had a quiet first term with a highlight coming in the second quarter being a strong mark and goal. He was moved onto ball in the second half and was much more prolific there. He had several touches through the middle trying to will the Knights back in to the game, and had a magnificent solo effort on the half forward flank where he took on a few players and got the ball forward but unfortunately his kick let him down. He also had several big tackles in the second half resulting in a couple of holding the ball frees. D’Intinosante finished with 21 touches, five marks, nine tackles and a goal – with an extremely productive second half. Gardner played predominantly across half back, gathering lots of the ball in the second quarter when the ball was stuck down there. His decision making at times was sometimes questionable and he would turn it over in close proximity, needing a few follow up possessions to fix the mistake. In the second half he continued to rack up the ball and seemed to use it more effectively. He set up a few shots on goal in the second half, but unfortunately his team mates could not capitalise. He ended with over 23 touches, nine marks and six tackles, patrolling the back half and along the wing. Carafa was good all day and tried hard in a tough day out for his team. He fumbled a little early in the game but his touch got better as the match wore on. He had a few passages of play that showed his class including a spearing kick to a teammate inside 50, a centring kick under pressure that hit his team mate in full stride and a few good clearances in the second half. His decision making let him down on occasion seeming in two minds, this was evident when he played on, ran himself into trouble and handballed straight into the man on the mark at the end of the first half. Overall he was a good contributor on the day and one of the best for the Knights. A quieter day for the reliable defender who did not get a lot of the ball in the first half whilst playing down back. This prompted a move to the wing where he found a few possessions but struggled to get involved as the Ranges ran over the top of the Knights from the second quarter onward. Showed off his versatility by spending time in attack as well. Took a few kick outs and showed good penetration in his kicks earlier in the day. Philp was big all day, gathering lots of the ball across half-back and often reading the play well and being the first to the ball. He also peeled off his opponent and laid a lot of tackles to hold up the Ranges in the first half. Philp had many highlights including a free kick and 50m penalty, resulting in a goal. In the second half, Philp rebounded and took the ball down the wing well often finding team mates. Philp showed great work rate running out the game strongly and giving strong repeat efforts late into the game and making lots of stoppages all over the ground. Philp finished the game with a team high 26 disposals to go along with nine tackles, five marks and a goal. Cox started in the backline but was moved all over the ground. He took a great mark in the first quarter but did not see much of the ball before half-time. In the second half he played a mixture of half-back/half-forawrd and got a bit more involved, laying a strong tackle and taking a good mark. Ended up being a pretty quiet day for Cox with seven touches, three marks and two tackles. Mellis picked up where he left off last week, showing great zip, energy and attack on the ball in the first half. Had a great centre clearance where he pumped the ball deep inside 50 resulting in a score for his team. He also cut off a kick reading the play well before going back and goaling in the second quarter. His hard chasing and tackling was evident and he showed great two-way running ability. In the second half he seemed to elevate his game further, involved in several scoring plays and setting up his team mates. He showed a great solo effort wrapping up a player 45 metres out and getting a holding the ball decision before going back and slotting the goal which was his second in a row in the last quarter. Mellis was the standout performer on the day with 29 disposals, six marks, six tackles and three goals to cap off a great day. Rossiter started the day in a lot of contests, but let himself down with a few fumbles. He showed great competitiveness and intent though, following up his mistakes and laying some big tackles. He worked forward in the second half and kicked a good goal. Rossiter’s tackling was his standout for the day laying lots of big tackles and wrapping up Knights opponents. His stats finished with 14 disposals (four kicks), 10 tackles, three marks and a goal in a serviceable outing. Hirst started the game with two great defensive efforts, one locking up the ball and the second chasing an opponent down from 30 metres behind him to force a turnover. He was always on the move and showed great energy whenever the ball was around him, promising to excite. In the second half he brought it all together roving the ball and using great vision to set up team mates on a few occasions. His pace and run lit up the team in the second half as he had multiple passages where he took on opponents – or chased them down when he wasn’t close to the contest. Hirst was rewarded for his hard running with a great snap goal in the last quarter. He finished the day with 19 disposals and a goal but the standout was his defensive pressure, laying nine quality tackles. McCormack started forward and had a few shots on goal but was not accurate in the first quarter, booting a couple of behinds. He also had stints in the ruck, amassing 14 hitouts. Ended up doing a few good things around the ground, but his inaccuracy (three behinds) in front of goal stopped it from being a really strong game. Peatling had a very dominant second term, with the midfielder/forward hitting the scoreboard after winning a free-kick for a strong tackle on his opponent. His ball use when entering the forward 50 was reliable and consistent. Peatling was one of the best players on the day, finishing with two goals and over twenty possessions. Lucas started in the midfield and played predominately on the outside where he received the ball from his teammates. He found plenty of it early on in the first term and even though his possessions weren’t extremely damaging, he was one of the reasons for the Giants’ fantastic opening quarter, where he repeatedly drove the ball into the Giants’ forward half. Lucas’ work rate also stood out, with the midfielder making plenty of contests throughout the day. Green was involved early on, winning the second centre clearance of the game for his team, along with booting a first-quarter goal fifteen minutes later. He accumulated plenty of the footy and was prolific in contested situations. For his size, Green is exceptionally clean at ground level, which makes him a very damaging player around stoppages. His ball use and composure also caught the eye on the day. Delahunty’s forward craft was a standout. He was able to take a few marks inside the forward 50 just because he was playing in front of his opponent, rather than from behind. He took a very nice mark on the lead in the second term but was unable to convert his set-shot attempt. McGrory won a 50-metre penalty in the defensive half that resulted in him delivering the ball deep inside the forward line for the Giants’ first major of the day. His athleticism stood out in the second term when he took an impressive intercept mark just outside his team’s forward half. McGrory also demonstrated his ball-winning capabilities and his clean ball use by foot during the match. Campbell won plenty of the ball on the inside and he tackled strongly. One of his best passages of play came early on in the second term when he kicked an important, thumping goal from 50 metres out, keeping his team in the game. Campbell finished with a game-high three goals. Thorne was clean by hand and made smart decisions. He competed hard all day and continued to drive the ball forward on all occasions. His inside work was evident, along with his defensive pressure around the contest. Thorne had a game-high six tackles. Barling was good in both contested and uncontested situations. He continually put his head over the ball and always did his best to make himself an option around the ground for his teammates. He won many one-on-one contests around the ground, signifying his strength and smart body use. He was the Swans’ top ball-winner for the match. Martyn is a really nice mover in the midfield, and showed his impressive agility around the stoppages here. He looks to be on the move for the majority of time, zipping in and out of tight situations to send his side forward. While his numbers were down (12 disposals) and his kicking left a little to be desired on occasion, Martyn worked hard and seems to always find the ball in good areas. Can become a damaging midfielder with surer kicking, but has enormous potential. Typically a damaging forward runner, Crozier’s output looked to be limited to action between the arc in this game, and he missed an opportunity to hit the scoreboard as he so often does. Still put in a good shift with 19 disposals and was a good link on the wing, working hard for nine marks to help Brisbane play the short build-up game. Reville really catches the eye and was on form early, playing most of the game through the midfield. He is such a smooth mover and looks a natural footballer, often receiving from the extractors at stoppages and bursting forward seamlessly. His decision making and effective use were features in the first half, with Reville showing great awareness to know when to lower his eyes going forward, or prop and deliver the ball laterally. While he did not quite go at 100 per cent efficiency, Reville’s clever delivery by foot made him stand out and ensured he was a damaging forward mover. Reville faded out slightly as the Suns got on top late, but ended with a team-high 25 disposals to go with a clever soccered goal in the second term. Equalled Reville’s output in terms of possessions with 25, but played a more selfless role as the extractor in midfield. Winning a good amount of contested ball, Griffiths was effective by hand and released his outside runners, while also spreading well to win the ball in all areas of the ground. A hard worker, and one you may miss if you do not watch closely. Mahony was very busy through the midfield wining plenty of the ball and using it well by hand and foot and he was one of his teams better performers in the first half. He was everywhere in the third quarter and he had a nice bit of play taking a nice mark inside 50 and a quick wide kick to teammate Angus Hanrahan lead to a goal. Mahony showed he was one of the most skilled players on the ground and he finished the game with 25 disposals and five tackles. Maginess showed a lot of class through the midfield with his clean hands and strength at stoppages, he had a strong start to the game and was even better in the second quarter taking a nice contested mark and did some nice repeat efforts at the contest with clean ball use at the same time. Maginess would hit the scoreboard in the third quarter cutting off an opposition player and ran in to kick the goal. Maginess was a strong player around the contest and he finished the game with 24 disposals, six inside 50s and a goal. Byrnes was very busy through the midfield early in the game but his disposal seemed rushed and he was not as damaging early as he was in recent weeks and it was more of the same during the whole game. His third quarter was quiet but his best bit of play came in the last quarter with a nice kick inside 50 to teammate Charlie Dean, he would finish the game with 21 disposals and six inside 50s. Ralphsmith had another good game mostly as a link up player on the wing using his dash and clean disposal. His first goal came in the 2nd quarter running into open goal, he would have a good movement in this quarter burning off an opponent with pure speed and then turning on a dime and hitting a nice short pass under pressure. He would continue to show of his dash in the third quarter with a nice run from the wing into the forward half and he would have another solid quarter, he would kick his second goal from a strong mark in the last quarter and converting the set shot. He would finish the game with 15 disposals, four marks and two goals. Dean continues to lead the NAB League for goals and that has came from his great leading patterns which he again showed early, taking a strong contested mark and kick a set shot goal 15 minutes into the first quarter. The second goal came in the second quarter from a nice mark and set shot finish, he would continue to provide a good target taking a nice lead up mark in the third quarter and delivering a nice short kick inside 50. Dean was a great target all day and he finished the game with 16 disposals, six marks and two goals. McAsey had a similar game to last week starting slowly before becoming more involved as the game went on, he started the second quarter well with a good chase down tackle and was solid overall for that quarter down back and would improve again in the third showing his neat skills by hand and foot. McAsey had a neat game down back finishing with 12 disposals and three rebound 50s. Worrell was physical early hitting contests hard and tackling with intent, his skills by hand and foot early where very solid, he was very important repelling a lot of the oppositions attacks in the first half. His disposal dropped in the second half but his positioning in defence was fantastic and he was still having an influence. Worrell was his teams standout defender with 23 disposals, four marks and five rebounds. Another solid game for Bryan who competed well in the ruck especially early on working in tandem with gun midfielder Matthew Rowell. His second quarter was the most impressive with some lovely tap work in the ruck and even showing his skill with ball in hand with a nice kick inside 50. His tap work was the standout but he showed even more tricks with a great tackle on Sandringham speedster Hugo Ralphsmith in the last quarter. Bryan finished the game with 11 disposals, three tackles and 33 hitouts. Bianco was all class for four quarters and was a big reason for his side coming close to knocking off premiership favourites Sandringham. His first half was strong using the ball well down back and in the third quarter he showed why he is considered one of the better skilled players at Oakleigh with a fantastic opposite foot switch kick to teammate Matthew Rowell. Bianco was huge in the last quarter starting to be an influence up the ground, some standout moments came with a lovely kick to the advantage of teammate Dylan Williams inside 50 and he would latter look after Williams again with a fantastic pickup and quick clean and long handball over the top for Williams to run into open goal. Bianco finished the game with 26 disposals, four inside 50s and five rebound 50s. The in-form player in the Nab League so far again had a solid outing he was his usual impactful self working hard through the middle early and linking up well in transition. Anderson was quieter in the second and third quarter but would kick his first goal from straight in front close to goal in the third quarter. Anderson’s second goal came in the last quarter through a free kick and he was also a solid contributor through the midfield in the last quarter and would finish the game with 26 disposals, six tackles and two goals. Rowell was the standout player on the day especially early having a big say on the game through the midfield, not only was he tackling with intent but he also went in hard to win the ball and was classy with his ball use. He didn’t let up in the second quarter either, continuing to be a force through the midfield and in the third quarter he showed his skill with a classy opposite foot kick inside 50. Rowell excelled at stoppages but he also had an impact in general play especially in the last quarter taking a strong intercept mark and quickly kicking inboard to teammate Trent Bianco which started a great chain for Oakleigh. Rowell finished the game strong with 31 disposals, seven marks and eleven tackles. Williams had a rough start to the game he struggled to get involved in the play early but he started to have an influence in the second quarter taking a nice lead up mark and delivering a nice kick inside 50 which was unfortunately dropped by is teammate but later in the quarter he would kick his first goal which was a nice goal on the run. Williams got a chance through the midfield where he showed some good signs with his movement in traffic, he had one nice bit of play showing clean hands under pressure standing up in a tackle and finding a difficult handpass. Williams looked set to take the game by the scruff of the neck in the last quarter taking a strong mark early and converting a set shot goal he would almost kick another goal from a similar situation that was touched on the line. His final goal came running into open goal to finish his game on a high despite the loss. He finished the game with nine disposals, four marks and three goals. 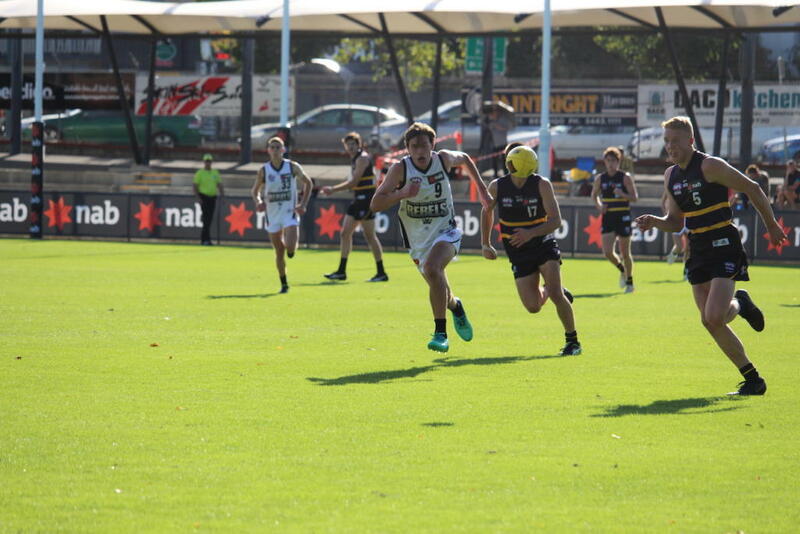 Mott had an impact early kicking the first goal of the game which was a lovely opposite foot goal in general play 40 metres out and the second goal also in the same quarter which was an easy goal running into open goal. Most was one of his teams more classy players with ball in hand especially by foot which he had some good movements in the last quarter with a lovely opposite foot kick to teammate Josh Kemp and another long kick inside 50 to the advantage of his teammate which was impossible for a defender to stop. In the last quarter he even showed a good burst of speed to get away from his opponent to get a kick away inside 50. Mott finished the game with 32 disposals, seven marks and two goals in a good four-quarter performance through the midfield. Ramsay was fantastic in the first quarter showing his class and work ethic laying a strong tackle and showing great composure and movement with ball in hand and he would latter kick a fantastic running goal from 50 metres. Ramsay left the game early and was a big loss for his side as he had started the game extremely well showing his speed and class. He finished the game with eight disposals and one goal. Kemp looked dangerous early he would set up a goal with a nice bit of play in the pocket working hard to win the ball and then a creative handball to set it up, and he would again have a similar bit of play although not leading to a goal but he would almost kick a goal showing lovely hands and movement and then snapping only to be touched on the line and again would come close with a great lead and diving mark but the set shot was changed to a kick to the hot spot. He looked good again in the second quarter showing his leap with a great contested overhead mark but the set shot dropped short and another chance from a nice lead up mark but again not kicking the goal. Kemp would have a quieter second half but showed his kicking skills with a nice pass inboard with a bit of composure in the last quarter, Kemp finished the game with nine disposals and four marks. Newman had a very quiet game, especially for his standards, he defended first and he still showed his game awareness with a nice bit of play in the second quarter positioning himself well having a run and clearing a long kick outside defensive 50. Newman did not have many standout moments in the second half and he finished the game with four disposals and three tackles. Jeka showed good presence early taking some nice lead up marks and proving a difficult matchup for the Calder side but he could not quite put it on the scoreboard with a set shot behind and one not making the distance from long range. He would show his class with ball in hand taking a nice mark on the wing and quickly kicking inboard twice one on his preferred and one on his non preferred. He had a good highlight in the third quarter taking a mini specky getting the knee in the middle of his opponents back but again failing to kick the set shot, he would finish the game with nine disposals, six tackles and two behinds. Cassar started the game well hitting a lovely pass under pressure and showing good movement and speed from a stoppage deep in defence, he was classy down back in the first half showing his speed on many occasions and cool head under pressure. Cassar was a good four-quarter performer and a major reason for the Jets staying in the game and he finished with 24 disposals and eight rebound 50s. Honey has had a tough start to the year and again didn’t start the game well although showing good movement trying to take the game on early, he was taken down in a good tackle. Honey would show his class in the second quarter with a great contested mark on the last line and converting the easy set shot he also had a strong tackle in the third quarter and should have been rewarded with a free kick. Honey tried hard but he will be looking to have bigger impacts on the game which he is more than capable of, he finished the game with 14 disposals, six tackles and a goal. I was impressed with the way he went about it and was one of Bendigo’s most consistent across the four quarters. The bottom-age midfield has a neat left foot kick and is not afraid to take the game on. He had a terrific spearing pass into Brodie Kemp early in the game and showed great core strength throughout to stand up in tackles and get his hands free. Conforti has high football smarts and can find space whilst in traffic, it is just sharpening up the kicking when at top speed. Gets around the ground comfortably. Not as prolific as past games, finishing with just the nine touches and one effective kick but still managed to hit the scoreboard courtesy of a free kick inside 50 in the second term. He showed good vision to give off a long handball to a teammate in space in the same quarter, and had a chance for another goal from a set shot in the third quarter but missed to the left. Impressive across the four quarters, he kicked the Pioneers’ opening goal of the game with a ripping shot to bend the ball back through the big sticks in the right forward pocket. He took a great mark at half-forward then kicked low in favour of Caleb Fisher in the pocket. With time and space he can be real damaging, and it is just tightening up the kicking when under pressure at speed. Kept winning it and has a knack of spinning out of trouble. Good hands in traffic too. Had a solid game throughout playing his usual role in the defensive half and pushing up the ground to take a number of intercept marks. He has a long, direct kick which he uses effectively to put into dangerous positions, but will often size up his options and pick a shorter option. Has strength, applying a fend-off to an opponent and still being able to dispose of the ball. Does not play a bad game and on this occasion, Serong was one of Gippsland’s best across the four quarters, rotating between midfield and forward. He has great skills and is able to weight kicks well, while also having terrific strength for a small player. Serong just has the ability to get his hands free whilst being tackled, and force opponents to commit to the tackle before giving the ball off to a teammate in space. He had a mind blank in the third term where he gave away a downfield free for a slightly late bump on an opponent, but got forward and booted two goals using strong hands. The forward-turned-midfielder had another impressive game throughout the four quarters, tending to win the ball at the stoppage and get the hands free to find a teammate running past. He would then spread to the outside and win the footy in space and have an impact on the outside. Providing strong support on the inside for Gippsland and laid a number of big tackles on opponents throughout the match. His kicking can be hit or miss at times, with his long, penetrating kick more effective than trying to find targets at short range. Dunkley unloaded a long-bomb from well outside 50m and put it straight through the middle, and when inside 50 provides leads and is good in the air or ground level. A solid game from the AFL Academy defender who played well one-on-one and is composed with ball-in-hand in the back half. He had a great punch in the second term to put it across the line at half-back and took a good intercept mark on the wing not long after. Continued to apply great defensive pressure and played his role. The defender-midfielder just finds the ball wherever he goes and had a nice clearance straight out of the middle to start the game and his ability to win the ball in transition and get it forward was a feature of his match. Has a neat kick, often opting for shorter options, then pushing forward to offer as a target in space. A valuable, underrated midfielder in the side. Not a huge game by any means, but played his role inside 50 with his bodywork and finished off with a goal and a couple of score assists. Had a great kick inside 50 to Harrison Pepper leading out, and laid a great tackle in the first term to cause a spillage in defence. The best game of the season so far for Phillips who has an impact despite not having high disposal numbers. Finishing with just the 12 touches, Phillips roamed around the forward 50 and up to the wing, booting 3.2 in the game and showed high footy IQ and a great goal sense to kick a couple of goals out of nothing. He also showed good defensive pressure, laying a number of tackles inside 50. Effectively nailed the coffin shut in the final term with back-to-back goals including a snap off a few steps and converting a set shot. The key defender was another who played his role with little fuss, taking a few marks and just using the ball well across the ground. Reid did not miss a target and played well one-on-one, but his moment of the match was a massive goal-saving tackle in the final term as an opponent ran into an open goal, stopping him in his tracks. The potential top five selection showed a good aerial ability and strong penetration kick throughout the four quarters as he played his best game for the season. Often winning the ball at half-back or along the wing, Young was ably to double back into the defensive 50, then get up the ground to send the ball into his team’s own attacking 50. Mopped up well throughout the game, though did make one clanger in the third term when kicking out of the back half which was intercepted and led to an opposition goal. Could not fault Young too much throughout, almost kicking a massive goal from the wing in the final term. After a delayed start to the season due to injury, Cahill was really impressive through the midfield, winning both contested and uncontested possessions and most importantly, getting the ball forward to provide scoring possibilities. He has such clean hands and does not fumble much, able to use his footy smarts to keep moving without being caught. Used the ball well more often than not and certainly had a big hand in Dandenong’s drawing the match. The premiership co-captain provides the stronger body on the inside and experience to the young Stingrays’ midfielders with another solid game. He finds space and is able to kick long to dangerous areas. Riordan is clever at reading ruck taps, and provides good defensive pressure with a number of fierce tackles to stop opponents in their tracks. Started in defence and went forward in the final term, booting two goals and missing a couple which were also gettable. He had to judge the wind which was swirling around, but managed to lift for the Stingrays in that charge home. Would like his time again when trying to kick in the goal square under pressure, but his strong marking and leading looked good, and he was very settled in attack. An exciting prospect who continues to turn heads because of his ability to look dangerous whenever he goes near it. He has a nice kicking technique and great acceleration, which makes him a damaging prospect in the forward half of the ground. Weightman has clean hands and despite copping a head knock in the final term, was fine and a key player in Dandenong’s win. Showed some nice signs as a bottom-ager and while he did not win a lot of the ball, used it really well and had a touch of class about him. He took a strong mark opposed to Hayden Young on the wing and showed no fear, and has a penetrating kick that he put in the path of Charlie Sprague during the third term. Courageous with good vision and composure, he is one to watch over the next 18 months. Another bottom-ager who stood out in the draw was Lazzaro who stepped up in the absence of the injured Cooper Stephens. Continually cracking in and laying some big tackles, shovelling out the contested ball and winning the clearance, Lazzaro was quite impressive with his kicking action and getting it forawrd. Just showed a few nice signs on the weekend in the forward half as a creative type who can win the footy. Kicked a great goal in the third term and just seems to move well and get himself out of trouble. Won a lot of his possessions under pressure and held himself up well, sharing the ball around to teammates in the forward 50. A serviceable game for the overager who would have liked to have made more of his forward chances. Had some nice passes of play such as a good leading mark diving forward, but then kicked it out on the full. Set up a couple of teammates going forward and pushing up to the wing, won the ball and used his body well to fire a quick handball to a teammate running past in the opposite direction. Stationed at half-back, Clark showed good body pressure on his opponents at ground level or in the air and repelled a lot of Dandenong attacks. He was outsized late in the game against Sam De Koning, but aside from that, had a really promising game with strong kicking and a couple of good intercept marks in defence under immense pressure. Just consistent throughout the match. The way this bottom-ager plays it is no surprise he is a Rioli. His presence of silky skill was complimented beautifully by his dashing speed. Although he did not have huge numbers his possessions were damaging thanks to his precise vision and ability to lower his eyes. A run-down tackle at the start of the third quarter got the crowd up on their feet. In what was a frustrating day for the Thunder star, Jungfer’s efforts can not be questioned. The Devils seemed to have put a lot of time into the midfielder following last weeks performance and he wasn’t given much space throughout the game. Finding it hard to get his hands on the ball in the first half, Jungfer’s second half showed promising signs and he worked hard to finish with 17 disposals and five tackles. The 17-year-old swingman was immense for the NT boys. Playing as the key forward at only 189cm, his athleticism contributed to him being a serious aerial threat and the devils defenders were cautious of his raw talent. When the Devils began to get on top, a smart coaching move saw Jeffery go back, where his marking ability alongside a deadly long kick saw him gather 20 disposals including seven rebounds out of the defensive 50 to go with his earlier goal. O’Connell was the Thunder’s best by far. He had a big first term where his gut running and damaging kick gave him the opportunity to kick back-to-back goals and allowed his team to get on top early. Rotating through half forward and the midfield, when O’Connell had the ball the Thunder looked at their most dangerous. He gathered 16 touches and finished with three goals. In what was a disappointing day for the Thunder, the 199cm monster dominated in the ruck. Finishing with 40 hitouts, the next best hit out count on the day between both teams was six. The big man also exploited the new ruck rule where he on numerous occasions took the ball straight out of the stoppage giving first use to his midfielders. His football smarts largely contributed to his 17 handball and 22 disposal day. The Thunder had no response to O’Neill’s dominance throughout the whole day, he was unstoppable. The dashing on baller amassed a massive 35 disposal performance including 21 kicks and nine inside 50’s. Not only did he hurt the Thunder by foot going inside 50, but his quick hands in and under the stoppage allowed the Devils to have a huge second quarter and control the game from there on. Was clearly the best on ground. The big bodied midfielder showed a display of pure strength. Despite having a clear defensive role in which he got on top of his opponent, Burrows-Cheng was still the first player to get his hands on the football at the stoppage and was impressive all day. Working tirelessly all game he laid seven tackles and defensively was brilliant. The game seemed to slow down when McGuiness had the ball. The half back had elite composure out the the defensive 50 which stood out along with him hitting targets using both sides of his body. McGuiness also was very solid defensively where his ability to read the ball allowed him to get the upper hand on his opponents. Callow could have had a really, really big day. He dominated the Thunder’s defence all game and finished with five goals however if he kicked straight could’ve easily had seven or eight to his name. Callow did not once get out-marked and either took the grab himself or brought the ball to ground to which his small forwards appreciated. Callow was the go-to man for the Devils and the well built key forward’s work rate was impressive – often providing a target well up the ground. The 19-year-old ruck/defender has made a strong start to his overage year and while he had less impact on the weekend, still showed enough signs to suggest this year could be a big one for him. He moves well for a taller player and does not panic when potentially quicker players are in pursuit. He has a nice sidestep and even attempted to go for a run in the first term, taking a bounce before opting for a handball. He patrolled the backline and switches the play when required, taking a good intercept mark in the final term and backed himself to move around a player and take off down the field. An accumulator who plays his role for the team with minimal fuss and just wins the ball every week. Wild is a player who does his best work around stoppages, often firing out handballs or kicking clear of danger. Found a fair bit of it in space on the wing and pumped it long inside 50. Another overage player at the Bushrangers, Barzen had some nice moments inside 50, kicking a couple of goals and assisting in some others. Still looking to find consistency across four quarters, Barzen had a quieter second half, but still acquitted himself in the forward arc. Had a late chance for a third goal with a snap under immense pressure but missed. If there is a player in the NAB League competition that catches the eye, then it is most certainly Lachlan Ash. Hardly putting a foot wrong, Ash’s ball use is elite and some of the kicks he produces are bordering on perfection. Ash will almost always pick the right option and does not just play safe, going for the deeper, penetrating kicks forawrd to set up attacking plays, even if the kick comes attached with risk. He set up a number of goals, including one in the first term to Will Chandler, and the winning goal to Jay Hillary in the final quarter. The amazing thing about Ash is the fact that he firstly takes the game on, but secondly brings teammates into play by drawing opponents and giving the ball off, or providing shepherds to allow teammates to kick cleanly up the ground like he did in the final term. Ash is terrific overhead and really does it all. Had an influential first term in the midfield, and played a solid game throughout the four quarters as one of the Bushrangers’ best. Still finding consistency throughout the match, Chalcraft’s ability to sidestep opponents with ease and just pump the ball forward makes him a damaging player wherever he is playing. Chalcraft has good core strength and stands up in tackles, also having a nice kick under pressure in the opening term to hit a target at half-forward. He spreads around the ground and a good work rate, and finds the ball when in midfield. Does not make a heap of errors with his disposal, and more often than not is able to put the ball to a teammates’ advantage. Floated around the ground providing an option in space, taking a number of marks and keeping the ball moving in transition. Boyer’s worked hard to spread to the wings and flanks and is able to use the ball well under pressure. A nice kick of the football, his lateral movement and good vision make him a handy prospect. One of the better Bushrangers on the day and just keeps winning the football and providing an option to his teammates. A classy forward who just has that knack of finding the goals, he was disappointed in himself missing a few early chances, before kicking two for the game, including a natural instinct shot off the left to win the game for the Bushrangers. Hollands also shows good second efforts, giving off a quick handball before following up with a tackle immediately after. Worked hard throughout the match and played a solid game to continually find space rotating through the midfield and half-forward. Still needs to fine tune some consistency having a quiet second half, but was prominent early in the game with 10 touches and five marks to half-time. Finished with the 13 disposals, but did a lot of things that were outside the stat sheet. Hill ran hard and kicked a goal into the breeze in the second term after a “typical” Hill goal from a tight angle in the pocket in the first term. A classy performance and as clean as they come at ground level. Used the ball well throughout and showed neat kicking across the ground. In the third term, Martin showed his composure by nullifying a ball in the forward pocket despite being chased by two opponents. Kept getting busy around the ground and offered himself as an option with 10 marks, rotating between midfield and half-forward. Also laid a number of good tackles, but the standout feature was his one-touch ability at ground level. Made some uncharacteristic errors by foot in the game, kicking at just 50 per cent, but his pressure was still high. While the normally classy Wareham had some nice disposals at times, it was his hunting of the ball and ball carrier which stood out. He is not a huge disposal winner, but always goes for a smother or tackle whenever possible and plays a great team role. Shot onto my draft board after the match on the weekend and will be one to watch. The former basketballer is still very raw, and does make mistakes by foot at times, but some of the natural things he does are very eye-catching. Rantall has an eye for the goals and was able to kick a couple of majors, one off a step from long range, timing the kick perfectly, then had another snap around the body from a stoppage in the third term. His energy levels and second efforts are very impressive and his overall athletic capabilities are off the charts. By far the moment that caught everyone’s eye was the final centre stoppage where he read the tap to perfection, burst away and hit a pass onto the chest of a leading forward. Had a few nice plays around the ground and weight his kicks, but also made some errors by foot. He worked hard to push back into defence at times and also got forward, moving around the ground well. Had an important fist under pressure in the defensive 50 in the final term.